Home » MILES, NELSON A. Miles has been called the premier example of the citizen-soldier in America for, with no military training whatsoever, he rose to Commander of the U.S. Army. Commissioned as a captain when the Civil War began, Miles' abilities were quickly recognized and, in May 1864, he was appointed brigadier-general while he was but 24 years of age. With one exception, Miles fought in every important battle in which the Army of the Potomac participated, and was awarded the Congressional Medal of Honor for his service at Chancellorsville. Remaining in the Army after the war, Miles first assignment was the thankless task of overseeing Jefferson Davis' incarceration at Fort Monroe. After this, Miles spent much of the rest of his career at the Western frontier in successful campaigns against the likes of Sitting Bull, Crazy Horse, Chief Joseph and Geronimo. In 1894, as Commander of the Department of the Missouri, he was responsible for putting down the riots and disorders which accompanied the Pullman strike in Chicago. In September 1895, Miles was appointed Commander of the U.S. Army, a position he held until his retirement in 1903. In this capacity, it was Miles who commanded the American troops during the Spanish-American War. 1884, Oregon. 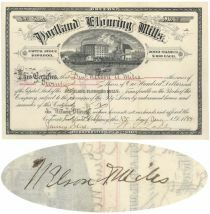 Stock certificate for 20 shares. Black. Vignette of harbor with Portland Flouring Mills building and grain elevator. Issued to and signed on verso by General Nelson A. Miles (1839 - 1925), Civil war hero and Indian Fighter. He was present at nearly every engagement of the Army of the Potomac and was distinguished at Fredericksburg eventually being awarded the Medal of Honor. After the Civil War he became custodian of Jefferson Davis. His later service on the Western Frontier achieved victories against the Cheyenne, Comanche, Kiowa and Arapaho. In 1875 he was instrumental in driving the Sioux under Sitting Bull into Canada. He captured Chief Joseph in 1877. In 1886 he was appointed commander of the Department of Arizona where he succeeded in capturing Geronimo. Miles was the only man to serve as a commander during the Civil War, the Indian Wars and the Spanish-American War. He even volunteered to serve in WWI but was turned down by President Wilson. Very fine condition. Pen cancellation not affecting Miles' signature.